Designed specifically with life safety in mind for safe room protection against tornadoes and hurricanes, the StormDefender™ not only tested and certified to stringent ICC 500-2014 and FEMA P-361, third edition code standards, but is invisible until called into service. Compact grille with intelligent operation! The MicroCoil Grille requires nearly 50% less headroom compared to standard grilles on the market. It also operates quietly at speeds of 24 inches per second and requires no maintenance other than routine checks. When it comes to Rolling Service Doors, Security Doors, Fire Doors, or Insulated Doors, our Overhead Door solutions have all the options and solutions to meet your needs. Experience the convenience of downloading all your essential documents in one place! Access data sheets, specifications, and BIM objects for all of our product lines. If you're a contractor, chances are you're looking at this on the fly while at a job site. We have easy access to our codes and listings, products and the best way to contact us. Explore our various rolling garage door and grille offerings or take a look at applications for our products. If you are in need of anything from Roller Garage Doors to Security Grilles, we can help you find the right product for your job. Need Insulated Door maintenance? Our roller garage door dealers can do that. Want to enhance your roll up garage doors with an accessory? Our dealers have that covered too. Need a part for your Security Doors? They're on it. From aesthetics to function, our worldwide network of dealers can help you keep your business rolling. Cornell Innovative Door Solutions is the leader in custom built Overhead Rolling doors. Whether your needs include Rolling Service Doors, Security Doors, Fire Doors, Insulated Garage Doors or Security Grilles, we have the right fit for you. When it comes to Overhead Doors, our Rolling Steel Doors provide options that are secure, durable, customizable and compact. Every one of our roller garage doors is made to your custom specifications and our expert craftsmanship ensures that your Roll Up Garage Door will seamlessly fit into your existing designs. If Security is a need, our Security Doors and Rolling Security Gates are custom designed for ultimate and fast protection. Our Maximum Security Doors help protect employees, businesses, customers and more from a variety of events such as riots, vandalism or looting. In addition, our durable Rolling Security Grilles keep areas off-limits, require almost no maintenance and can be customized to meet your desired aesthetic needs. Fire and smoke is a growing content building concern. When it comes to roller garage doors, installing Fire Doors will help block smoke and stop fire to save lives and property. Our Rolling Fire Doors compartmentalize a fire event quickly. This allows adequate time for people to egress – escape – from the building. Our Counter Fire Shutters also help to create a fire barrier where required. When looking for Insulated Garage Doors, look no further. Cornell is a rolling door industry leader in Insulated Doors. Our energy-efficient insulated roll up garage doors help provide climate control and protection from the elements while also increasing security and reducing sound transmission. 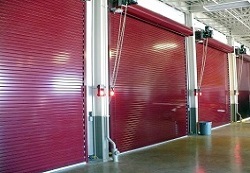 Cornell is a pioneer in innovative Rolling Doors and Rolling Grilles. Our High-Performance rolling garage door product lines offers Fast Rolling Door speeds and Long Lasting Overhead Door designs that help with your High Traffic Roll Up Garage Door needs. Building owners and maintenance managers love the solutions our Low Maintenance Grilles provide for parking garages and other high traffic areas. In addition to creating fire barriers, Rolling Counter Shutters can also be utilized with or without fire protection for security and accessibility in counter applications, like cafeterias, ticket booths, and other compact areas. We manufacture many different styles, options, designs and accessories to meet all your shutter door needs. As an innovator in Accordion Folding Doors, our durable accordion partitions provide convenient solutions to for separating areas and rooms for security and privacy. The pocket wall design gives you additional solutions when dividing a large area or room into smaller sections is a need. Our Architectural Design Support team is able to provide Architect Tools and customized fast support for commercial and residential roller garage doors and rolling grille needs. We provide Overhead Roll Up Garage Door specifications and BIM Objects for download. Use our custom drawing generator to get exact dimensions and drawings for all our Roller Garage Door, Security Grille, High-Performance Roll Up Garage Doors, Fire Rated Doors and other products. Cornell also provides ongoing Architect Continuing Education with AIA credits or lunch and learn presentations. We would be happy to help you better understand any roller garage doors questions or needs you have.